Micellar cleansing waters have been a hit with the beauty community for a long time. I finally got around to trying one for myself, and I am hooked! Garnier's Micellar Cleansing Water is an all-in-one that cleanses, removes makeup, and refreshes skin. No harsh rubbing or rinsing required. It's comprised of a Micellar technology that helps lift away oil, dirt, and other impurities for cleaner, hydrated, and refreshed skin. This product is dermatologist and ophthalmologist tested, and it won't clog pores. I didn't know what to expect from Garnier's Micellar Cleansing Water, but I was pleasantly surprised at how much I actually liked it. It's super easy to use-just saturate a large cotton round with the cleansing water, and start wiping away. To cleanse the skin and remove makeup, wipe all over until the skin is completely clean. To remove eye makeup, hold the pad over closed eyes for a couple seconds, and gently wipe. Simple, right? I do think this micellar cleansing water effectively removes makeup and cleanses the skin. However, I find that I need to work a little harder / use a bit more product when it comes to removing my eyeliner and mascara on those extra glam eye makeup days. If you are one who always sports heavy duty eye makeup, I suggest trying out the waterproof version of Garnier's Micellar Cleansing Water, as that one may work quicker and better. My skin is on the sensitive side and I have not experienced any irritation or reaction from using this product. This doesn't strip or dry out my face either, which I really appreciate. After use, my face feels super smooth, clean, and refreshed. I love it! This way of cleansing definitely differs from traditional makeup remover wipes I was using before. And to be honest, I don't even miss the wipes! I totally prefer Garnier's Micellar Cleansing Water, being that it's more gentle on the skin. 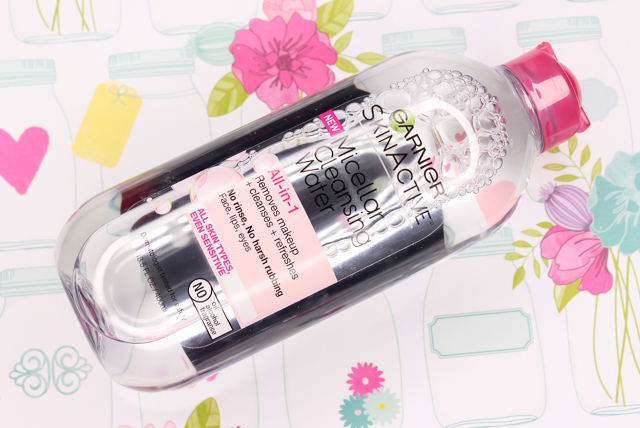 If you are new to Micellar cleansing waters, consider giving this one from Garnier a try. It's affordable, and you may be surprised at how well this works, and how nice your skin will feel. Which are your favorite micellar cleansing waters?